A STUNNING 57 shades of terra-cotta color the Grady Grammage Auditorium. 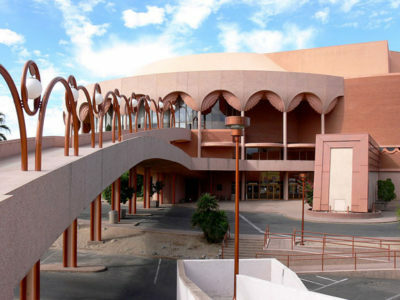 The first time I became aware of the stunning power of architecture, I was 17 and walked into the terra-cotta cocoon of Grady Gammage Auditorium in Tempe, AZ. The building sparked a life-long interest in architecture, “the great mother art,” as Frank Lloyd Wright called it. Wright used 57 shades of terra-cotta in the auditorium. He was a master of color. He was a master of almost everything. I noticed the carpeting, light fixtures, water fountains — and scallops and circles everywhere. How could all these things be so deliberate? Modernist design vocabulary came to the U.S. through the influence of late 19th- and early 20th-century European artists, designers, and architects. At the same time, Wright developed the elements of his philosophy of American modernism to which he held fast for most of his career: the relationship between function and utility; and the use of sculptural, organic forms and modern materials and technology. He was wedded to natural materials, symbolism, site-specific design, and what he called spiritual integrity. “Study nature, love nature, stay close to nature. It will never fail you,” he wrote. He practiced his art for close to 70 years. ENNIS HOUSE is among the Mayan revival, or “textile block” style houses by Wright. Next for Frank Lloyd Wright in Los Angeles was a quartet of buildings made up of the 1923-1924 Ennis, Freeman, Millard, and Storer houses. They are known as the Mayan revival or “textile block” houses due to the patterns in the concrete blocks that make up the skins of the structures. The art and architecture preservation-minded community of Los Angeles is to be commended for its determination to keep these irreplaceable buildings intact for the future. The last and largest of the four textile block houses is Ennis House, in Los Feliz, made up of 27,000 patterned and perforated hand-made concrete blocks. In 2005, Ennis House was endangered and deteriorating. The existing nonprofit organization of a previous owner was unable to assure the property’s preservation. Larchmont Chronicle publisher John Welborne was a facilitator in organizing the new Ennis House Foundation, made up of a consortium of organizations — the Los Angeles Conservancy, the National Trust for Historic Preservation, and the Frank Lloyd Wright Building Conservancy. Welborne brokered a deal to raise funds to stabilize the house. The house is privately owned now — in the hands of a preservation-minded steward, according to Welborne. Wright’s final commission in the Los Angeles area was the 1952 Anderton Court Shops in Beverly Hills. Look for Wrightian influence at one of my favorite buildings in Los Angeles, the 1988 Japanese Pavilion at the Los Angeles County Museum of Art, the work of architect Bruce Goff (1904–1982). Wright was Goff’s mentor. In turn, Goff was mentor to Bart Prince, who finished the Japanese Pavilion after Goff’s death. To hear Bart Prince tell it, sometime in the 1950s Goff and Wright stood together on a building site.